Later my paternal Grandfather (Norman Jones) bought a dairy farm. Here he is standing proudly with his fleet of farm trucks.In those days milk was delivered directly from the farm. When the farm was sold my father took over the milk delivery side of the business using the Morris Commercial which my Granddad is standing beside. 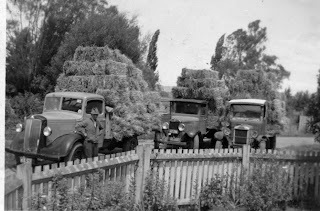 The farm was located in the Kuripuni area of Masterton. Hence the street name of Jones Place off Colombo Road.